Increasing global competition has resulted in widespread outsourcing of manufacturing businesses. In order for outsourcing to succeed, organizations need to share sensitive information with development partners and suppliers. Many of these suppliers, however, may also be competitors so protection of confidential information, particularly intellectual property, is critical. The traditional linear supply chain needs to become a responsive supply network. Companies have to be able to share sensitive planning and manufacturing data across a global and multi-level supply chain. NextLabs data-centric security solution is designed to facilitate the safe collaboration required for global product development and an efficient supplier network with increased data security. It combines enhanced access control for PLM and SCM applications with rights management capabilities to protect data when it leaves the application and is shared throughout the extended enterprise. Dynamic Authorization technology provides the foundation for enhanced protection across all applications and repositories. Before a user is authorized to access sensitive information in applications or documents, the system utilizes variables or attributes about the user, the data, and the environment to ensure that the user is really authorized to access the information. This allows for a more granular level of authorization control to prevent unauthorized access. Easily classify engineering data such as CAD drawings, engineering specifications, demand data, supply data, and BOMs to ensure they have the right protection. Protect any file type with persistent protection throughout the sharing process. 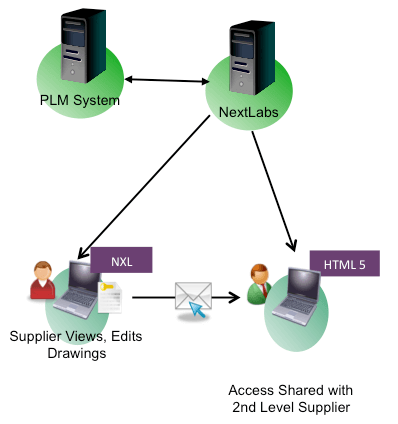 Provide out-of-the-box integration with key PLM and SCM applications for short time to value. Prevent misuse and improper disclosure of company or partner IP in a multi-level environment. Enforce data security policies in accordance with confidentiality and information-sharing agreements. Centrally define and manage attribute-based policies to ensure consistency and enforcement across all applications and systems. Automate user education on policies and procedures to prevent inadvertent misuse. Provide centralized tracking of data access and usage for audit and compliance reporting.